Forced to abandon plans for a two-orbit express rendezvous after a last-second ignition abort on Sunday, Progress MS-08 took flight atop its Soyuz 2-1A rocket on Tuesday and had to stick to the scenic route, taking the spacecraft to its orbital destination after 34 laps around the planet. Progress MS-08 is the 161st Progress spacecraft launched since 1978 and the 71st Progress launched toward the International Space Station; the first of three Russian cargo missions to the orbiting laboratory in 2018. Per the original plan, Progress MS-08 was to become the first mission to demonstrate a new two-orbit flight scheme designed to ferry cargo and crews to the International Space Station even faster than with the current four-orbit mission profile, shaving another three hours off the transit time from the remote Baikonur Cosmodrome launch pad to ISS, orbiting the Earth over 400 Kilometers in altitude. The plan for the fast-track rendezvous fell through on Sunday when the Soyuz 2-1A rocket suffered an automatic abort of its ignition sequence after the onboard control system of the carrier rocket detected a mismatch between its onboard sequencer and the control equipment on the ground at Baikonur’s Site 31/6. As a result, Soyuz aborted its countdown before firing engine igniters and remained in a safe configuration on its launch pad – a scenario reminiscent of Progress MS-07 which had to abandon its two-orbit rendezvous attempt for the exact same reason last October. At the time, the control equipment asynchronicity was seen as a random occurrence since previous Soyuz 2-1A launches from the very same launch pad had gone off without a hitch. The suspected culprit within the rocket’s flight control system was replaced and Progress MS-07 lifted off after a two-day delay and successfully arrived at ISS where it remains today. The recurrence of the problem showed it was of a systemic nature, not a random issue and Roscosmos started in-depth reviews of the connection between the two aborted launch attempts. A new flight control unit was sent to Baikonur from a different manufacturing batch and installed on the Soyuz booster in preparation for the re-aligned launch attempt on Tuesday. 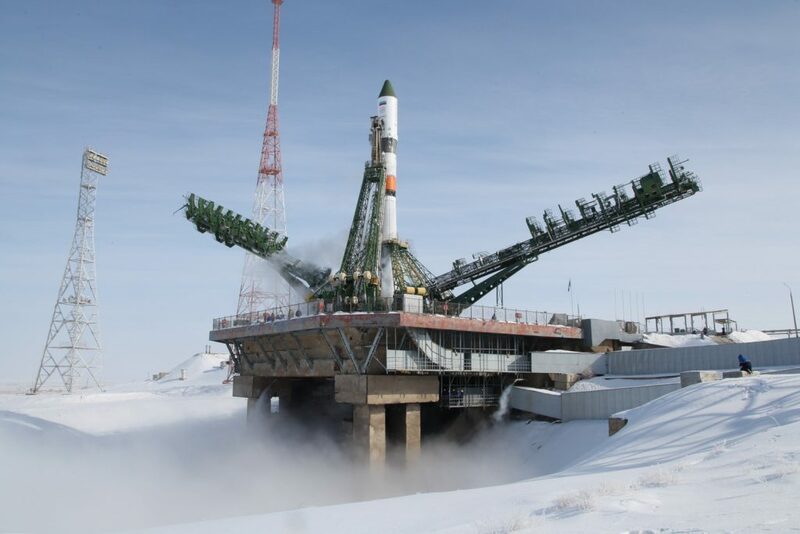 Standing tall atop its Baikonur Launch Pad, Soyuz 2-1A re-started countdown operations Tuesday morning, local time, entering propellant loading at the T-4-hour mark to receive some 274 metric tons of Liquid Oxygen and rocket-grade Kerosene. Soyuz started its automated countdown sequence at T-6 minutes to pressurize its tanks and switch to internal power before assuming control from ground computers. This time, the Launch Command went through without issue, the two Umbilical Masts retracted from the 46-meter tall rocket and Soyuz fired up its RD-107A booster engines and the RD-108A on the core stage to soar to full thrust. 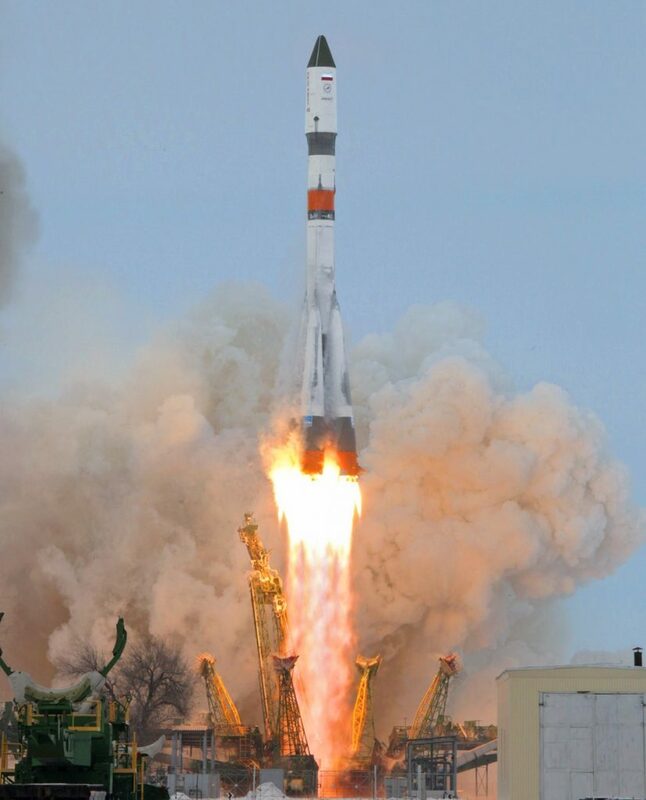 Overcoming counterweights, Soyuz lifted off at precisely 8:13:33:233 UTC and climbed away from its launch pad with a total thrust of 422 metric ton-force before pitching and rolling onto its north-easterly ascent path to deliver the 7,430-Kilogram spacecraft to the orbital plane of the International Space Station. This mission, like that of Progress MS-07, served as a rehearsal for future crewed Soyuz missions on the 2-1A variant – requiring the launch table to be rotated by 60 degrees to comply with the Soyuz launch abort system’s fixed coordinate system & pre-launch abort direction; and jettisoning the launch shroud 183 seconds into the mission, as would be the case for a crewed ride. 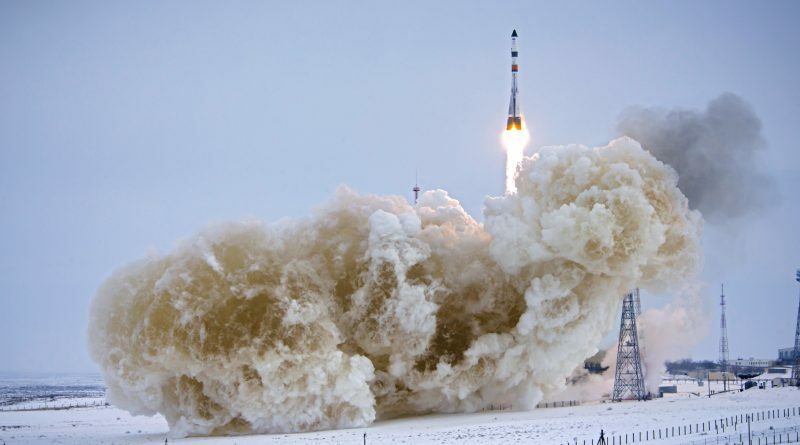 Soyuz 2-1A dropped its four boosters 118 seconds into the flight when each had exhausted its 39.6-metric-ton propellant supply and helped accelerate the climbing rocket to a speed of over 1.5 Kilometers per second. 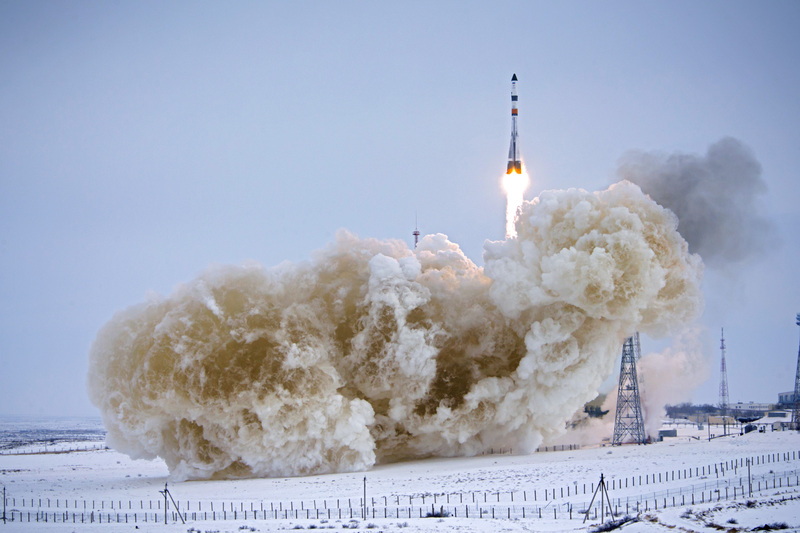 With the boosters swinging out and away, Soyuz continued its climb relying on the four-chamber RD-108A engine of the core stage alone, creating 102 metric-ton-force of thrust when flying through the rarefied layers of Earth’s atmosphere. The payload shroud split open three minutes and three seconds into the flight when Soyuz had crossed 100 Kilometers in altitude and the Block A core stage continued firing until T+4 minutes and 45 seconds when it handed off to the Block I third stage for the final push into orbit. Separating from the 27.8-meter long core, Block I headed on toward orbit powered by its RD-0110 engine, delivering a vacuum thrust of 30,400 Kilogram-force. Soyuz shut down its third stage eight minutes and 46 seconds after liftoff and Progress MS-08 was sent on its way three seconds later, setting in motion a series of time-tagged commands to initiate the deployment of the spacecraft’s power-generating solar arrays & KURS navigation antennas and the pressurization of its Unified Propulsion System. 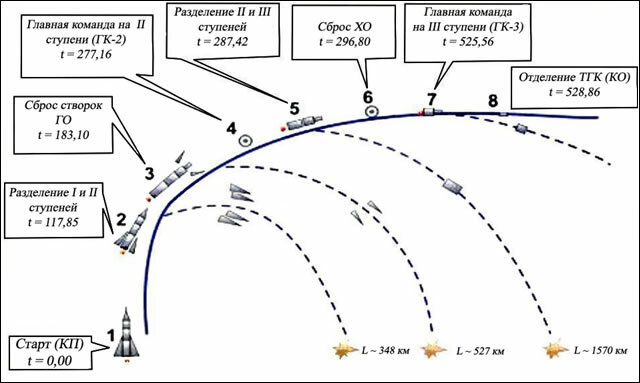 Orbit parameters published by the Russian Mission Control Center showed Soyuz achieved an orbit of 193.1 by 241.2 Kilometers, inclined 51.67° which marked another bullseye injection for the modernized Soyuz, very close to the target orbit of 193 x 240 km, 51.67°. 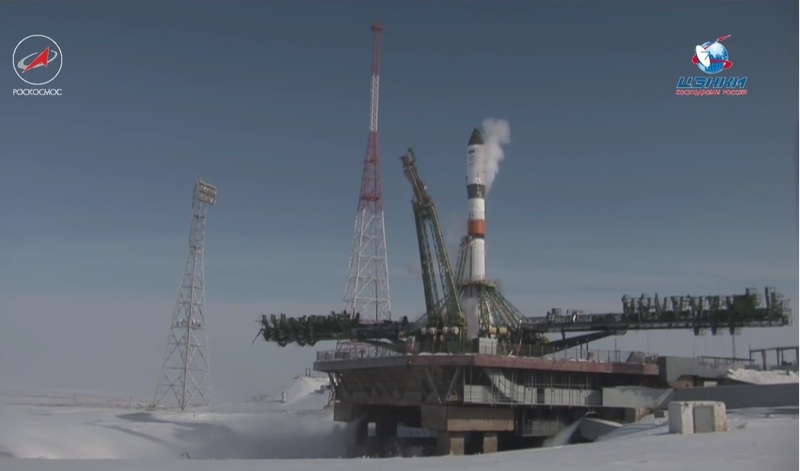 Heading off on its extended, two-day rendezvous, Progress MS-08 used the tried and true procedure that has been proven over and over again since the Soviet Salyut Program. Progress MS-08 was to perform a pair of burns using its KTDU main propulsion system on its third lap around the planet, accelerating by 32.3 and 34.7 m/s, respectively, to lift itself into an orbit of 319 by 340 Kilometers. A small correction maneuver on Wednesday was to place the spacecraft into an orbit of 320 by 345 Kilometers where it was to remain until initiating its Automated Rendezvous Sequence at 8:20 UTC on Thursday. Through a last ground-targeted main engine burn, Progress MS-08 maneuvered into communications range with ISS to allow the automated KURS navigation system to take over and calculate subsequent rendezvous impulse maneuvers according to measurements of the relative geometry between the approaching Progress and its orbiting target. These maneuvers went by the book and Progress arrived on the Station’s doorstep for a test of the TORU remote-control mode by Cosmonauts Anton Shkaplerov and Aleksandr Misurkin to ensure they could bring the craft in for a manual docking if need be. 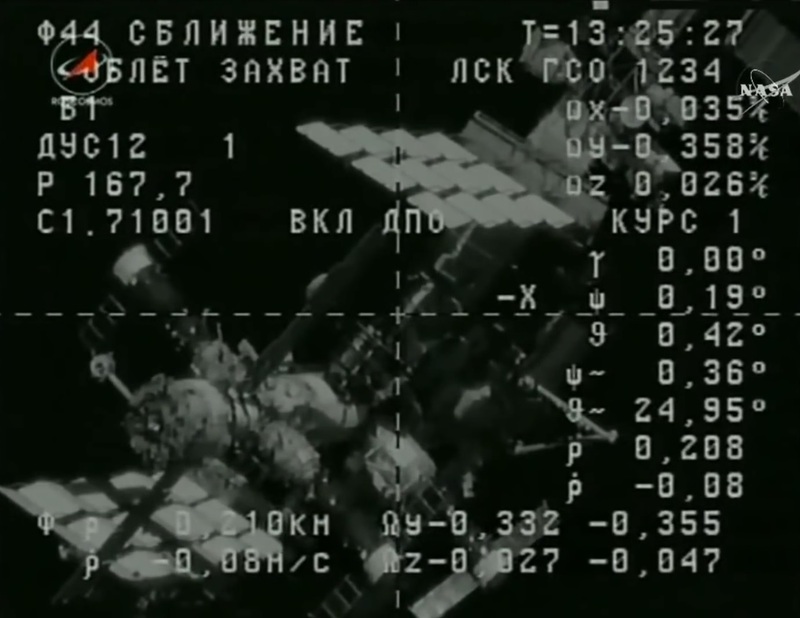 Progress remained locked on its target on autopilot and entered a slow lap around the Station at a distance of 400 meters to line up with the aft-facing docking port of the Zvezda Service Module. 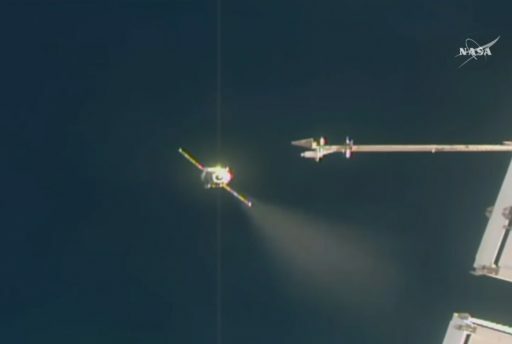 After a brief period of Stationkeeping, Progress MS-08 was commanded into a straight-in approach culminating in contact and capture at 10:38:42 UTC – sending ISS into Free Drift and Progress into a translational maneuver to ensure all capture latches engaged properly to create a safe docking. The docking process was finalized by the retraction of the Docking Probe and closure of hooks on both sides of the docking interface, clearing the way for the pressurization of the vestibule area and the usual leak check before hatches to the spacecraft were opened by the Russian crew members to access time-critical cargo packed into the pressurized section of the Progress. Progress MS-08 is delivering a total cargo upmass of 2,494 Kilograms comprised of 640 Kilograms of refueling propellant for the Space Station, 420kg of water for crew consumption and oxygen generation, 22/24 kg of oxygen/air to top up the Station’s atmosphere and 1,388 Kilograms of dry cargo. The dry cargo itself includes 282kg of food provisions, 140kg of crew supplies, 103kg of medical and hygiene supplies, 103kg of NASA cargo, 194kg of science hardware and supplies, and 568kg of maintenance gear, fire protection equipment and outfitting hardware for the Russian segment. Progress MS-08 is booked for a stay through August 27 per current ISS planning schedules which always remain fluid and change with ongoing operations. The next visiting vehicle activity on the Station’s schedule is the rotation of Soyuz crews with Soyuz MS-06 carrying Misurkin, Mark Vande Hei and Joe Acaba back to Earth on February 27/28 (UTC) and Soyuz MS-08 launching Oleg Artemyev, Drew Feustel and Ricky Arnold on March 21, also using a two-day flight profile. The next cargo mission on manifest is the Dragon SpX-14 mission looking at an early April liftoff.